On Friday afternoon I started feeling this... itch. Hard to describe really. Kind of a tingle at the base of my spine that slowly crawled up my back like a roving pack of nanite-infused spiderlings. The itch made it's way to the base of my neck and then injected itself via a synth syringe into my skull. 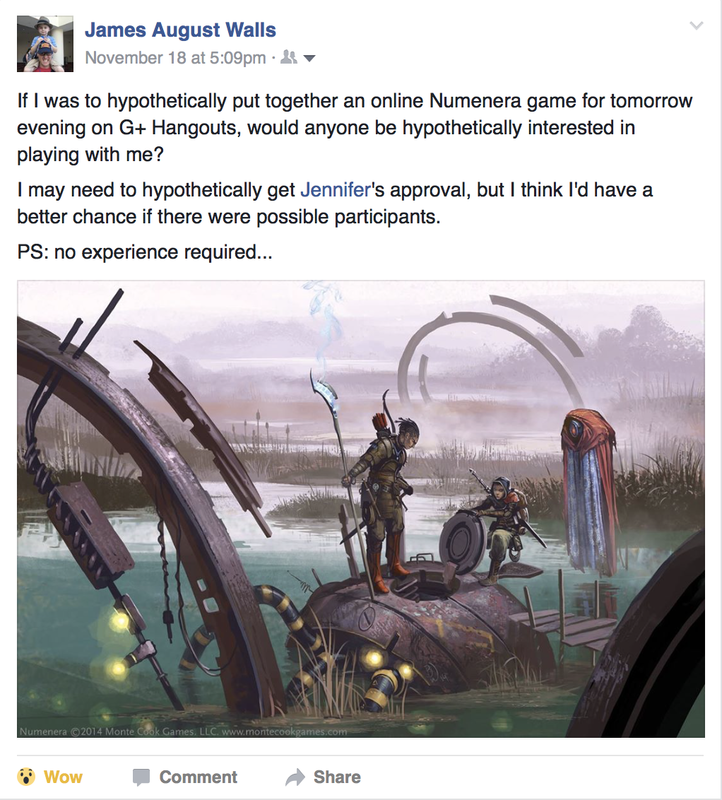 The itch was Numenera, and it started taking over my mind. The Ninth World was calling, and I needed to return home, and fast! So I did what just about everyone does nowadays to get a game going. I went on social media and put out a call for players. From the time I first posted to the game's start I had exactly twenty-seven hours and twenty-one minutes to prepare an adventure. No sweat, although unfortunately I had a lot on my plate that restricted my adventure prep time. Friday was Light Up Night in Pittsburgh, and I had already dedicated Saturday morning and early afternoon to prepare for a Gary Con 2017 adventure I was working on. I knew that I needed help. I walked up to my bookshelf, and listened carefully. "Psst," I heard from my books. I thought the sound was coming from the upper right part of the shelf. "Over here." Glancing up to the shelf, I flipped through the books, searching for the weird voice. "Hello?" I whispered carefully. Astoundingly, my copy of Weird Discoveries by +Monte Cook flew off of the shelf and landed at my feet. The pages flapped fervently as the tome spoke with a strong Navarene accent. "I will help you play." I gave Weird Discoveries a freeze-framed high five and then the two of us walked downstairs, hand in hand, just a few hours before game-time. 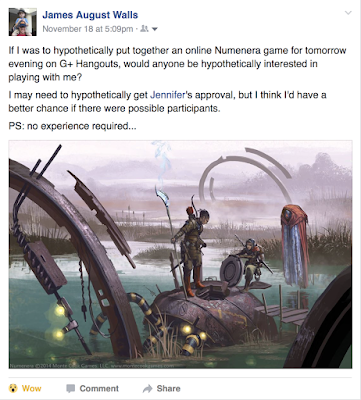 Weird Discoveries is an essential buy for any Numenera game master in 2016, especially those over thirty, with full-time jobs, spouses, kids, and goldendoodles. No time to prepare for a big game? Weird Discoveries has your back. Your kids are looking for a sweet bedtime story? Let Weird Discoveries soothe them into some bizarre dreams. I'm pretty crappy with reviews, so I thought the best way to share my thoughts on Weird Discoveries would be to list out the Five Reasons that everyone should love this Numenera adventure compendium. The number one reason for buying Weird Discoveries is for the adventures. You get ten of them in total, an each can be played as a stand-alone adventure or one-shot. Pretty straight forward reason for a quick purchase! I have the book in both print and PDF, but if I could only have one it would be the electronic format. While I prefer to read print books, I would rather GM from a printed copy that I can write on, highlight, and pretty much tear apart. After I read the first adventure in Weird Discoveries I had to give it a second read. The new format, touted well ahead of the books' release, took a little getting used to. The first two pages of each adventure give an outline of the entire quest, from start to finish. There's a summary, some light detail, a suggested starting and end point, and a list of "Keys" - plot points or devices that carry the story forward. The second two pages consist of a map and/or flow-chart of the adventure's structure. Here's where I got a little hung up during my first read. I noticed that the Keys could be found in multiple sections of the adventure. Wait, what? Let me read that again. Actually it ended up making a lot of sense! Each adventure is designed so that the plot keys can show up in several possible locations of the adventure. So if you're trying to run a quick, two-hour demo, there's a reduced chance of missing something important. Pretty sharp! The last two pages of each adventure give the GM a lot more detail behind the adventure, and yet are totally unnecessary for the game to make sense. Want to run a quick one-shot? Just read the first four pages. Want to stretch the adventure out for multiple sessions? Pages five and six give you more detail, as well as ways to set the adventure into an ongoing campaign. Reason Three - Pre-gens Anyone? I really appreciate how each character has been created using the Numenera corebook, and don't include anything from the Character Options books. While I have everything in the Numenera line, most new players start with just the corebook or the streamlined Numenera Player's Guide. So a new GM can grab Weird Discoveries and have everything they need for folks playing one of these six characters. You can't play a Cypher System game without cyphers... that would be utter madness! But it can be easy to forget about the little devices, especially if you're running a game for new players (or if you haven't run the game in four months.) Rolling up cyphers mid-game tends to slow things down, which is why I usually select them ahead of time. Weird Discoveries does this for you! Pages ten and eleven of Weird Discoveries includes thirty-six pre-generated cyphers for you to use with your friends and players. So when the adventure calls for handing one of these out, just pick one from the list. The level and effects are already listed out. If you have the adventure in PDF form, I recommend printing these two pages and then cutting each cypher out, maybe taping it to an index card for easy organization. I love visual aids, especially when someone else does the drawing! My maps tend to be a hot mess, and my drawings aren't much better than glorified stick figures and basic geometric shapes. Weird Discoveries includes a whole section of "Show 'Ems" so that you can give your players a true taste of the weird. I ran last night's adventure on Google Hangouts, so I had the PDF pulled up next to the hangout window. When it came time to show a picture, I just screen-shared. So simple! So what did we end up playing last night? I went with Please Help Us, an adventure that centers around a small group of explorers trapped within a tiny holding cell in the middle of a forest. 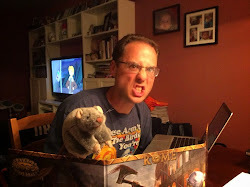 Minutes before starting the adventure, however, I learned that two of my players owned Weird Discoveries, and admitted to reading many of the adventures. 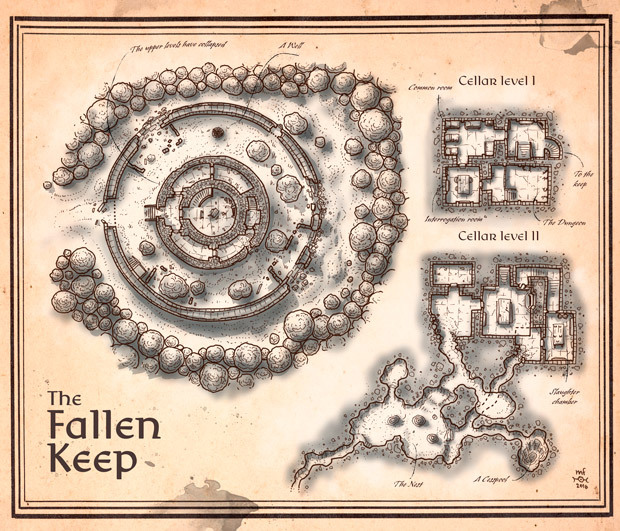 To change directions on my crew, I quickly reskinned the adventure, having it take place inside the mouth of a two-kilometer long, ancient, decaying humanoid resting by the Clock of Kala. The humanoid looked a lot like Robocop. All of the scenes of the adventure took place inside the giant humanoid's mouth, with the "Machine in the Wall" being more of a "Machine in the Tonsil." I also turned all of the abhumans into walking, talking white blood cells that had gained intelligence and wore clothing. +Alex Perucchini played Sidon-Barrex, the Lattimor Jack who Entertains. It had been four months since I had last GM's Numenera, although I did get a chance to be a player in +Troy Pichelman's game at Gen Con 2016. As we moved through the adventure last night, all of the wonder and delightful weirdness came back to me. My separation from the Cypher System had been too long, and my homesickness for the Ninth World ebbed. I returned Weird Discoveries to my book shelf, well after midnight. "Thanks, I guess," I said to the book. "No problem, dude," Weird Discoveries laughed. "Anytime." We did a quick and in no way awkward fist bump before I placed the book on the shelf. I walked to the edge of the room and turned out the light. "Iadace, Weird Discoveries," I called softly. But there was no answer. From the gentle snoring, and melodic flutter of its pages, I could tell that Weird Discoveries had already fallen asleep. "41-VEX, I've got forty-one reasons for you to buy a dewback!" - Jumper Mappy, the Mos Shuuta Dewback Rancher trying to close a deal with the party's Droid Colonist. On Wednesday we debuted out brand new Star Wars Rebels, Season 2 collection. Cooper and I watched two episodes while Evie did homework. Carrie didn't get home from an event until later, so we had to wait until 9pm again to get back to our Edge of the Empire game. While Episode I of Escape from Mos Shuuta was fun, especially learning the new game mechanics, we had a much smoother and engaging night during Episode II. Everyone started getting the hang of the rules system, which made gameplay a lot faster. Also, the adventure came off the rails, and the party was able to explore the city of Mos Shuuta a little before continuing along the path. Perhaps my favorite scenes all involved Cooper's Droid Colonist, 41-VEX, and the purchase of his new dewback named Mitchy. Cooper insisted that he wanted to visit the dewback stables, and then had to have one of the lizards. Once purchased (after some shrewd haggling), Mitchy became a full-fledged party member. When the party faced off with some pesky stormtroopers, 41-VEX and his trusty steed charged into combat. Cooper even used his dewback to talk his way past the droid guards out in front of the landing bay. Cooper insisted that the droids should pet the dewback, and then had a tremendous Coerce roll. So the entire team entered the facility while the guards were busy admiring Mitchy's silky scales. Cooper wasn't the only one with crazy ideas. In order to get into the landing bay with the Krayt Fang, Oskara (played by +Carina W.) claimed to be the new janitors for the landing bay. The ruse worked, although I informed my daughter that her "Despair" die result meant that the landing bay staff wanted her to clean an incoming Imperial shuttle. After some quick thinking the party slinked off in stealth-mode, quietly arriving just outside of the Krayt Fang. Technically we skipped the Star Wars "gaming" on Thursday and Friday, mostly because of work and then I had a DCCRPG game last night. But I did get some great swag in the mail: Heroes of the Resistance! Now I've got the updated Millennium Falcon from Star Wars: The Force Awakens, as well as Poe's T-70 X-Wing. On Saturday morning we resurrected our old tradition of "Dunkin' & Dragons." But instead of Dunkin' Donuts we went with Peace Love and Little Donuts, and instead of Dragons we went with Star Wars. Yes, it was time to complete our run through Escape from Mos Shuuta. Finally the party reached the Krayt Fang, and we were about to take off into the Stars. Continuing with their stealthy plan of disguising themselves as janitors, Oskara, Lowhrrick, 41-VEX, and Pash convinced the droids to let them on board the YT-1300 freighter for some light cleaning. As soon as they were all on board, however, the team attempted to take out the security droids quietly, before Trex the Trandoshan could figure out what was going on. The plan didn't quite work out... as planned. Oskara did a stealthy attack, as did Pash, but 41-VEX didn't get the memo. The droid used a stun grenade, lobbing it down the corridor towards the cockpit, hitting the security droids, Trex, and even Oskara! Cooper was amused. After slaying Trex, 41-VEX ran back to the engineering compartment and repaired the broken Hyperspace thingie. The Krayt Fang roared into the skies above Mos Shuuta and into the black, never ending night of space. The last part of the adventure was a short space battle between the party's YT-1300 freighter and a pair of TIE Fighters. The action was quick and exciting, and since we only had four players, everyone had something fun to do. I asked the group if they enjoyed the game, and everyone gave me a big grin. ... and Evie spent a lot of time working on her own character art. Even Cooper had some stuff to share! All in all, I think we had a fantastic time with Edge of the Empire. I had my reservations with the dice mechanics again, especially with tallying them up. I've had the chance to play in a few games of Age of Rebellion on Google+ and Roll 20, but we always use a dice-app to calculate the results. But as we moved along in our live-table game, the dice calculating went faster and faster. It really got easy when the symbols clicked with Carrie, and she was able to guide her brother... and mom... through the results. I'm thinking about continuing the story of these four characters on Tuesday night, with the Long Arm of the Hutt. Oh, and we also played some Star Wars X-Wing Miniatures today! Cooper has sat in on a few games with me and his sister Evie, but has never had the opportunity to fly against someone in a solo match. Well, today Cooper decided to take to the stars on his own! Cracking open our Ghost and Phantom box, we toyed with the idea of Cooper flying the Ghost... but then again that's a tough ship for a first timer. Since he really wanted to play as Hera Syndulla, the best pilot from Star Wars: Rebels, I set Cooper up with the Phantom. We each went with 25 points, and I picked a Scum and Villainy ship, the Kihraxz fighter. I've only flown it once or twice before, and never with a one on one, but it seemed like a balanced battle. I think the kiddo needs a bit more time in cockpit! He darted straight past my fighter, and then relied on a dorsal turret upgrade to pepper me from medium range. Maybe another round or two would've helped him get a victory, but I got very lucky towards the end of the game. In the end, I was able to shoot down Cooper's Phantom, forcing the Lothal Rebels to perform a rescue mission and save their pilot. At least Chopper was on board the shuttle to keep Hera company.